A modern living room can be beautifully finished off with a display of wall units incorporating space for a centrepiece flat screen TV. We sell a range of the latest 2017 designs of high quality modular living room furniture, flexible display units, TV cabinets, bookcases and drawers that sit superbly in a contemporary lounge or living space. Using wall unit displays give a cool, uncluttered finish for entertaining or relaxing. We deliver throughout the UK including London, Glasgow, Edinburgh, Aberdeen, Manchester, Liverpool, Birmingham, the Home Counties, Cheshire and the South West. Our ranges are sourced from well known and respected Italian furniture designers and manufacturers such as Tomasella, DallAgnese and SMA Mobili. The flexible modular storage and display units, integrated bookcases, drawer cabinets and contemporary chairs come in a variety of colours and finishes to ensure you have many options to choose from for that original look to your living space or bedroom. 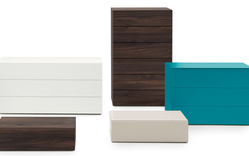 Finishes include glossy and open pore lacquer in white, grey and dark oak. 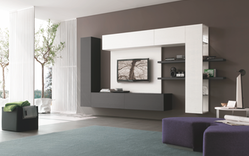 The Tomasella Atlante range of wall display units have soft closing drawers systems and adapters for media and electronic device connections and can be redesigned to suit the size and shape of your living room. This is an extremely flexible wall display and storage system for the living room and as such we have only selected and priced a few examples here. We would be pleased to provide prices and sizes for your specifications and discuss available options with you. If it is a unique or ultra modern chair you are looking for we also sell amazing modern bedroom and lounge chairs and chaise longue. Our own brand of bedroom chairs and chaise longue can be upholstered in the fabric of your choice to suit the decor of your bedroom or living room space. We also work with interior designers and boutique hotels to create and supply that one-off piece at trade prices.